A roving robot recently returned from a trip to Greenland. In the cold (-22 Fahrenheit) and windy (30 mph gusts) environment, the tough little rover was put through its paces. 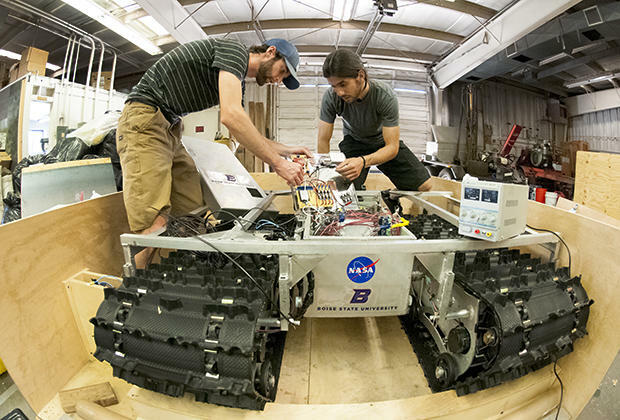 Two Boise State graduate students, Gabriel Trisca, computer science, and Mark Robertson, geophysics, spent a month with the rover on the frozen landscape. The robot, which is as tall as a person, uses a radar system, developed by Boise State geosciences assistant professor Hans-Peter Marshall. Known as Grover, the rover gets its name from two sources. Grover is shorthand for Greenland Rover. It’s also the initials of the Goddard Remotely Operated Vehicle for Exploration and Research. NASA’s Goddard Space Flight Center is in Maryland. That's where student teams, including Boise State's Gabriel Trisca, built the 800-pound robot. Grover looks like a triangle built out of two solar panels and two snowmobile tracks. It’s designed to use ground-penetrating radar to analyze layers of snow and ice. Grover performed well in Greenland, though the extreme polar conditions took a toll on the robot’s electronics and battery usage. It also got stuck in the snow. That forced researchers to tinker with its speed and track system. Researchers hope to tweak Grover so it uses less energy and generates more power. Grover is now at Boise State for modifications.